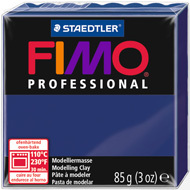 FIMO Clay from Staedtler is available in an enormous range of attractive colours and is manufactured in a variety of textures to make this material ideal for all skill levels from children to professional crafters. 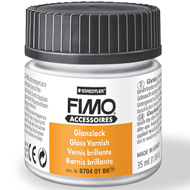 FIMO polymer clay is is extremely artist-friendly and versatile. It sets hard in the oven. Easy to use clay which requires little conditioning in 30 bright colours. Available in 57g and 350g blocks. Similar in texture to FIMO Soft. Special effect clays including glitter, translucent, stone, metallic, pastel, gemstone and nightglow. 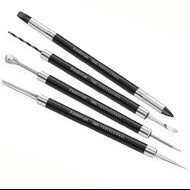 Polymer clay range for the more advanced or professional artist and modeller. Holds detail well. Available in 85g and 350g blocks. Ideal for doll faces and limbs. 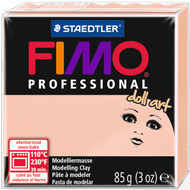 Formulated to hold fine detail well in a range of flesh colours. Modelling clay designed with the child in mind. Hardens in the oven. Particularly soft and smooth so does not need any preparation before use. Themed clay modelling sets for children. Includes all coloured clays, modelling tool, background scene and instructions. Everything you need to make great items from polymer clay. Sets for adults from beginner to advanced and children. Large range of books suitable for beginners as well as advanced books aimed at professional artists. The range of Sculpey polymer clays can be combined with FIMO clays opening up a vast range of alternative colours and textures.